FREE CIGAR.005 Lighter Charger when you buy IC-M25 VHF Handheld Radio. Ends 31st March 2019 (automatically added to basket when you add the radio). You can expect the following features with the IC-M25 EURO – it’s buoyant, with the ability float and flash when dropped into the water. It has a slim design, 30.5mm body, and it’s even lighter than anything Icom have produced before – just 220 grams! However, there’s no compromise on screen size, the LCD is 30% larger than the M23. You’ll also find a USB connector for convenient charging from a variety of electronic devices. Give yourself the peace of mind of having a radio which will last the pace – with a potential 11 hours long battery life coming from the built-in 1500mAh lithium-ion battery, you can relax. USB Charging can be done via the Micro-B USB connector on the VHF and can be charged with the supplied AC adaptor, BC-217 in approximately 3 hours. The IC-M25 provides a powerful 550mW (12 Ohm load) audio output and received voice can be heard loud and clear. The Volume loud and mute functions offer quick adjustment of the volume level by holding the VOL/SQL button and pushing the ▲ or ▼ button. The optional HM-213 waterproof speaker microphone provides extra convenience for leisure users. Looking to add a waterproof hand-mic? Click here. Also need an additional USB power charger? Click here. Great radio, does what it says on the tin. Easy to use. 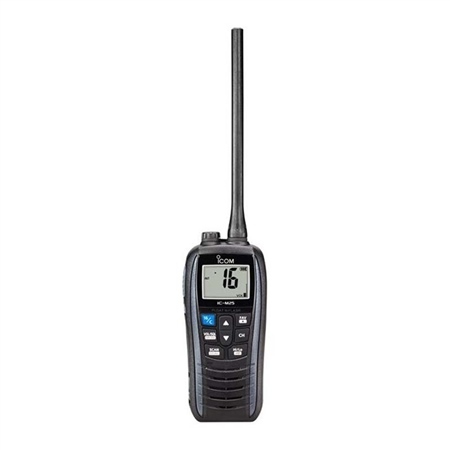 A good price for a second handheld for use ashore or in an emergency. Its floating and flashing sounds a bit of a gimmick - until you drop it!! Well pleased with the purchase, as it was a birthday present, new owner very pleased with the gift.